Notification: Good news for those who enjoyed this, or any of my other guides, or those who like to play Skadi! A guide update/conversion to S4 is in the works. No ETA as of yet, but it will take a long time. For more details about this conversion / update, read below. - An entire visual recreation. This will follow an entirely different structure than my other guides. - Updated information for S4! Fairly obvious, however. - More and more in-depth information. - Information for both new and more or less experienced players. What will you NOT find? - Anything regarding ranked or high-level play. I play for fun and therefore have no interest in the ranked scene, neither have I ever come in contact with it. If you want information about ranked with Skadi, I'm afraid you'll have to look elsewhere. This update / conversion will take a VERY long time before (final) release, so please keep an eye out. Thanks again for reading my guides, in any case! Hello fellow SMITE players, and welcome to my Skadi guide. This guide will focus solely on Skadi(and by that also the wolf Kaldr, I guess). Therefore, if you're looking for a guide on anything other than Skadi, this is not the place for you. Let's quickly list everything we're going to talk about in this guide. Summary - Who is Skadi and what is she capable of? Pros and Cons - What is good about Skadi and what are her weaknesses? Strategies - What you should and shouldn't do as Skadi. Items - Explanation why you should get this build. Abilities - The abilities that Skadi has. Including skill combo's. Ending - The Credits to this guide. Changelog - A log containing all the changes made in this guide, for quick notification of new updates. Art by: Sciamano240 via DeviantArt. Summary - Who is she? Unlike any other regular hunter, Skadi has a very unique kit. There is currently no other god that works in the same way as she does, there are however, gods that show similarities. What's so special about Skadi? 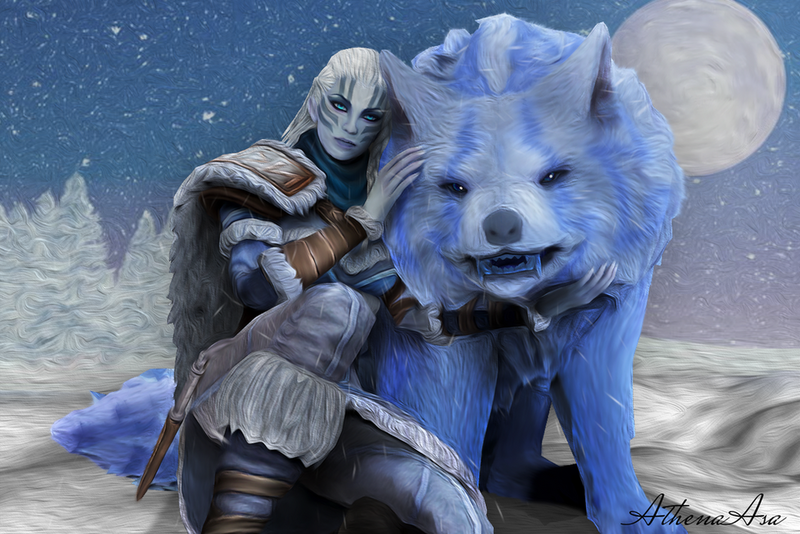 Skadi makes use of a full-time companion: her wolf, Kaldr. 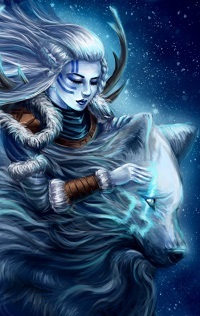 Kaldr is a unique addition to Skadi, as she (aka the player) can control the wolf at your own will. The stats show that Skadi's early game is rather weak... or is it? 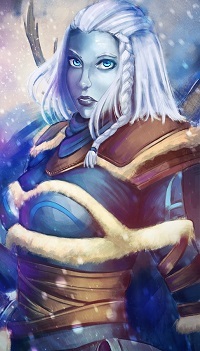 Remember, she has her companion, Kaldr. Skadi's early and mid game is on par with the other hunters. However, during the late game, Skadi will be a force to be reckoned with, as she is, partially due to her companion Kaldr, a very dangerous huntress! Art by: Juan-gato via DeviantArt. Strategies - What and what not to do? While Skadi may have a companion, you play her allmost identical to any other hunter: safely. During the early game, you're very weak and vulnerable. During this time, the enemy will do everything to kill you. This is to keep you low, so you do not become the late game killer a hunter is supposed to be. But don't worry! I've got you covered! Let's go over some tips that'll hopefully keep you out of trouble. The early game is the hardest time for any hunter. This is because they're still weak, but don't have enough damage yet to sustain themselves. 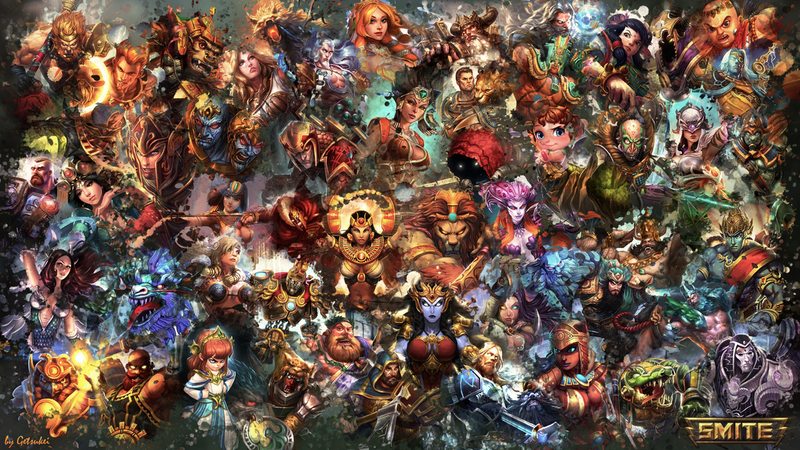 While in the (duo) lane, you'll be facing the enemy support and ADC, and occasionaly the jungler from either team. The enemy's goal is to eliminate you as much as possible, to keep you low and prevent you from getting your damage online. - Do not over-extend. As the ADC, you should not be found any further than half of the lane. Even 1/4th could arguably allready be to much. Once you cross this distance, you're putting yourself at a great risk of dying, especially since Skadi has no escape. - Stick to your support. Your support is your safekeeping charm. Keep it close, and you'll generally do fine. If you go to far from the support though, you'll be all alone and an easy target. - Wards. While laning, keep the jungle Warded at all times. This to avoid the enemy assassin from ganking you. The Jungle is a treacherous place for any hunter during the early game. The enemy assassin, or any other enemy roaming the jungle, can easily take you down. Here are some tips showing when to enter jungle. - Buffs. Only enter the jungle if you desperately need a buff. If the buff is not mandatory, do not go for it. - Enter with the support. Only enter the jungle with your support. Should the enemy catch you, your support can save you. - XP. If you really need some extra XP, you can quickly enter the jungle to clear an XP camp. The mid game time is similar to the early game. The only difference being that you can now take care of yourself. You should still think about the point from the early game, though. - Pushing lane. You can now push lanes safely. However, only do so when the enemy is forced to retreat, and you have safely Warded the jungle to avoid ganks. - Jungle longer, alone. You can now enter the jungle for longer periods of time. However, do keep in mind not to hang around, and only enter the jungle if needed. Furthermore, should you pass by an allied lane that is in need of help, you can now provide help, but don't get yourself killed. The late game is a hunter's favorite. During this phase, you'll deal lots of damage, however, do keep in mind that while you've grown alot stronger, so did your enemy. The laning phase is probably done by now. Should you find yourself still laning as you were during early and mid game, follow these steps. - Ward. It's not because you are strong, that Wards aren't necessary. A good enemy jungler can take you down easily. - Play safe, play equal. Do not attempt to engage and win in (1+X)v1 fights. They will get you killed most of the time. If you are facing more than one enemy, attempt to call your team for help. The Jungle should be fairly safe now. But stay cautious, as a quick sneak attack can wipe you out easily. - Ward. Use Wards to spot enemies throughout the jungle, and thus avoiding enemies sneaking up on you. - Stay near teammates. Should the enemy come out of nowhere, you better have some teammates to back you up before it's to late! - Not at the team fight. The ADC is crucial in teamfights, as you'll do alot of damage which is needed to take out the enemy. - Behind your team. Being behind your team is asking for the enemy jungler to gank and kill you. - Infront of your team. Being infront you'll take all the hits, CC, and eventually die. And a dead hunter is no good in any teamfights. Art by: FelipeAbreu via DeviantArt. Note: to ward, you'll need to buy Ward or Sentry Ward first, obviously. "Your lane": The lane where you (ADC / carry) should be. "Mid lane": The lane where your middle laner should be. "Solo lane": The lane where your solo laner should be. "Jungle A": The jungle next to your lane. 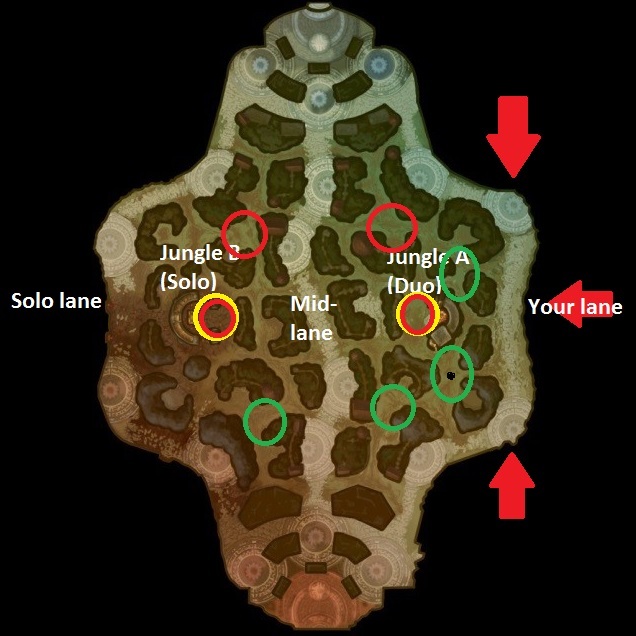 "Jungle B": The jungle next to the solo lane. Colored circles (aka warding points). Green: The green circles represent the wards you place in the early game. These wards should be placed throughout the entire game. Yellow: The yellow circles represent the wards you should place in the mid game. Red: The red circles represent the wards you should place in the late game. Note: A player can have a maximum of 2 wards up at a time. Ask your team to help ward these crucial points. The wards next to your lane, however, are your responsibility! - The wards near your lane are there to alert you when the enemy jungler is nearby. If you see him, immediately retreat to tower. - The wards in the jungle close to your fountain are there to see if an enemy is trying to take your camps. If they do, try to get the jump on them and kill them. Make sure you don't get killed, though. The "Yellow" wards should be placed during the middle of the game all the way untill the end. This is simply to make sure enemies don't take Fire Giant or Gold Fury. The "Red" wards should be placed at the late game untill the end. These wards are used to spot the enemy in their own jungle, and pick them off while they're alone, distracted and vulnerable. Note: before you go in for a kill, make sure there isn't a second enemy lurking around somewhere! Note: The "early-mid-late" game representations are only in "normal" circumstances. If you get behind or ahead, your playstyle can be altered accordingly. Just don't get yourself killed. Art by: AthenaAsa via DeviantArt. Warrior Tabi is the very core, together with Transcendence of this build. Without Warrior Tabi, you're putting yourself at a disadvantage. Why Warrior Tabi? The Warrior Tabi provides a great deal of physical power. Not only that, it also gives movement speed, which is entirely necessary on Skadi, as she has no other forms of escape. The Physical Power will give you and Kaldr a great power boost to start with. Transcendence is an item that's necessary on allmost every hunter. This item is so good, that it cannot be missed in anyone's build. The mana allows you to cast your abilities more often. This is especially important since your Piercing Cold is your main poke and clear. The high (stacked) power is a great power boost during the game. Transcendence not only gives Physical power, but also Mana, Mp5, and a nice passive. Asi is a very versatile item. It provides alot of benefits that can be used in plenty of situations. The penetration will help you neglect some of your enemies' base protections, and some protections from items. Lifesteal will help you sustain and stay in lane a lot longer, even through various pokes from your enemy. The attack speed will help both you and Kaldr to attack faster and get hits in quicker. Asi grants you lifesteal, attack speed, flat penetration and a somewhat decent passive. Passive: If you drop below 35% health, you gain an additional 25% Physical Lifesteal for 5 seconds. Can only occur once every 15 seconds. Jotunn's Wrath is well known for it wide array of benefits it provides. From physical power to cooldown reduction to mana increase, it has it all. The only thing that Jotunn's Wrath does not have, is a passive. CDR allows you to cast more abilities. This combined with Piercing Cold is very useful for wave clears + pokes. The power and penetration will increase your overall damage output, even to enemies with protections. Titan's Bane is very well known for the wonderous things this item can do. It is your go-to item to deal with tanks that build alot of Physical protections. It provides you with Physical Power and % Penetration, that'll come in very handy to defeat enemies with lots of defenses. Hastened Fatalis is a fun little item. It gives the player a great deal of speed in both movement and attack speed. The thing that makes Hastened Fatalis stand out, however, is it's passive. The passive allows you to move at normal speed while attacking, if you hit, allowing you to dodge enemy attacks easier while still doing a fair deal of damage. Passive: When a basic attack hits a target, the attacking movement speed Debuff is removed from you for 1s. Asi is a great item. However, the benefits are provided by other items allready. But xZeroStrike, then why do we keep it?! Because it's cheap. However, should you find yourself getting alot of kills and sitting on a pile of $$$, you can swap Asi for Bloodforge. Do note that Bloodforge is not cheap! Passive: Killing an enemy god forges a shield from their blood with Health equal to 200 + 10 per Player level for 20s. While the blood shield is active you gain +10% movement speed. Art by: Scylla812 via NewGrounds. Art by: Larinor via NewGrounds. Jotunn's Wrath has alot of benefits. However, if you want to eliminate your enemies defenses, and attack faster, The Executioner is for you! Passive: Basic attacks against an enemy reduce your target's Physical protection by 12% for 3 seconds (max 3 stacks). Having trouble landing those basic attacks? In this case, Hastened Fatalis won't do much for you. However, you'll still want that attack speed. What item to get? Odysseus' Bow to the rescue! Not only does it provide attack speed, it also comes with a nice, for this build fitting, passive. Passive: Every fourth Basic Attack triggers a chain lightning, damaging the target and up to 4 nearby enemies for 30 damage +50% of your total Physical Power. Note: Yes, there are no critical items. That is because Skadi doesn't need them. Kaldr allready allows Skadi to pretty much hit for 2. Using this item makes you invulnerable to damage for 2s, preventing you from taking actions. You may still move. Only get these relics if nobody on your team, especially your support, has them! Using this item buffs the Movement Speed of Allies within 55 by 40% for 5s. It also makes them immune to Slows for the duration. Using this item reduces all enemy gods Movement Speed by 40% in a 55 unit radius around you for 5s. Their healing is also reduced by 50% for the duration. As Skadi, your starting "kit" is very important. Running off with the wrong items will put you at risk. Not only do you risk to lose farm, you'll also risk of dying more often. Here are the (currently 2) starting "kits" and when to pick which. The Charged Morningstar and Boots start will give you an early mana boost, and a bit of extra movement speed. The movement speed will be useful to escape easier from though situations, while the mana will allow you to stay in lane longer. When to pick this starter kit? You'll want to pick this starter kit when you're facing enemies that can more easily catch up with you, mainly due to a leap/jump and the like. If you're facing any such enemy, pick this starter kit. The Charged Morningstar will give you an early mana boost. The Healing Potions and Mana Potions will help you keep your health and mana high enough to stay in lane longer and thus accumulate more gold. You'll want to pick this starter kit when you're facing enemies without a leap. The reason being that enemies with leaps can get to very quickly, without you having much time to react, forcing you to burn the mana and health you'll get from the potions, and perhaps even killing you, rendering the potions useless. Note: you can use either starting kit in either situation, these reasons are just my "recommendation". Move speed: 110% of Skadi's Lane minion damage: 1HP lost every 5 hits. Other source damage: 1HP lost every attack or ability. Ability type: Summon Pet. Note: HP regenerates at a rate of 1HP every 10 seconds. Note: Kaldr's dash attack has a 5s cooldown. Note: Kaldr deals 50% of Skadi's Basic Attack damage by default. Snowstorms surround Skadi and Kaldr. Upon activation, enemies in range become Rooted and Kaldr is restored to full health. The storms persist for 4s while dealing damage to enemies every .5s and making Kaldr immune to damage. Hit the enemy with Piercing Cold. Once you hit your enemy, send Kaldr out to attack with Rune Of The Hunt. Kaldr will now do double damage (basic attacks only) for a short period of time. Hit the enemy with Piercing Cold. Once you hit your enemy, send Kaldr out to attack with Rune Of The Hunt. When Kaldr attacks the enemy, use Winter's Grasp. Kaldr will do double damage for a short period of time while the enemy is rooted in place. 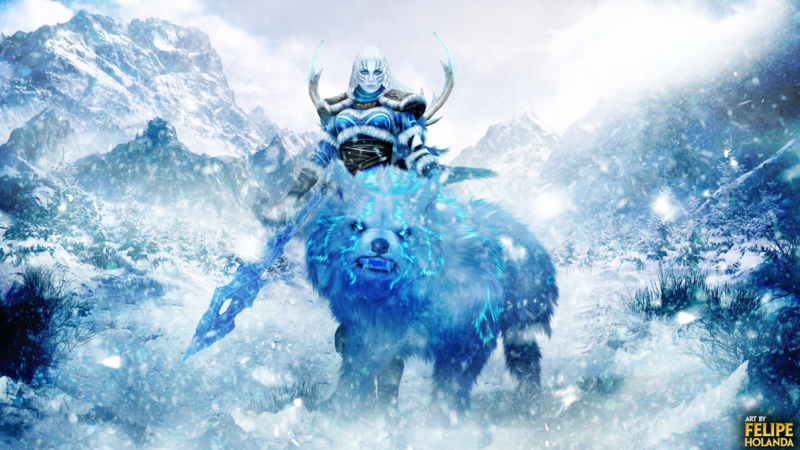 Use Permafrost to let the enemy lose control over his/her movement. While the enemy is sliding, use Piercing Cold on them for a free hit. Use Permafrost to let the enemy lose control over his/her movement. While the enemy is sliding, use Piercing Cold on them for a free hit. After you've hit the enemy with Piercing Cold, send Kaldr out to attack the enemy using Rune Of The Hunt. Kaldr will now do double damage for a short period of time. Use Permafrost to let the enemy lose control over his/her movement. While the enemy is sliding, use Piercing Cold on them for a free hit. After you've hit the enemy with Piercing Cold, send Kaldr out to attack the enemy using Rune Of The Hunt. When Kaldr attacks the enemy, use Winter's Grasp. Kaldr will now do double damage for a short period of time while the enemy is rooted. The skillset is similar to the previous one (Easy difficulty). The difference here being that you'll use Piercing Cold after Kaldr has used his dash to attack an enemy (with Rune Of The Hunt. This is because Kaldr's dash attack does not benefit from Piercing Cold's double damage, and by using Piercing Cold after Kaldr has used his dash, you'll maximize it's effectiveness. This skillset is similar to the one above. The only difference is that you'll use Permafrost before the rest of the combo. The difficult part is that you won't use Permafrost randomly, you'll have to place Permafrost in a way that makes your enemy slide towards you. If this is succesful, proceed with the combo as usual. This will conclude the end of the guide. Please take a moment to inspect the Credits. Without these people, this guide would not be possible/be what it is now. - Art creators (pictures). To view the source of the art, click the highlighted artist name under the picture to be redirected to the source. - 'Zeus Tube', the person who made the ability videos. - Myself, the writer of this guide. Changelog, only important if you're interested too see what changed. - Eliminated the use of bright, headache inducing colors particularly in the "What you should and shouldn't do." chapter. - Added starting option information: When what to pick to start? in the "Items - explaining what to build" chapter. - Eliminated the extensive use of colors to avoid distraction from the actual guide. 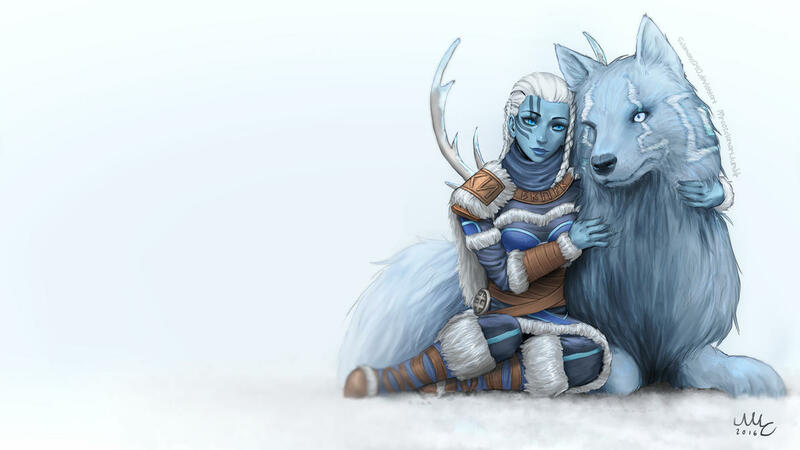 -Update all information to represent Skadi as of patch 3.15. -Update visual look of the guide. Attempt at better use of BB-coding. -More chapters with more information added. -Allready existing information may and probably will be altered to represent current meta. - Guide completely remade. Old builds/information archived, new added. - Added new chapters to the guide. - Huge improvement to BB-coding, for your reading pleasure. -Added a complete build description for the damage build. -Updated the guide to be more readable. -Reworked the "relics" chapter. Now more readable and better use of BB and colors. -General BB-coding and color improvements. -Reworked the "skills" chapter. Now looks better and is more readable. Use of spoilers takes care of the big wall of text. -Reworked the "items" chapter. Instead of using the list, now using spoiler. Increases readablity and fixes the 'jump' in text. -Added small banner to take place of another information guide on the new build. -The original release of this guide. -Guide cleanup, make everything more readable. -Update the guide when needed. Hello everybody! This is my personal SMITE Skadi build. The build is based around items that fit perfect with hunter classes, while also keeping Skadi's kit in mind. Just a heads up, this is my first guide. I am willing to take any feedback others may have, so that I may improve this guide where necessary, and perhaps make guides on other gods aswell. Why a Skadi guide? Skadi is new. Because she's new, not many builds have been found before, and not many players know how Skadi works yet. Of course, there are some quick learners out there, but others may struggle. Therefore, this guide. Perhaps the most important part of all of this, is Skadi herself. I'll explain Skadi here shortly. If you feel that it's necessary to obtain more information about her, use the link. Skadi is a hunter. Hunters are the type of class that perform badly early on in a game, but as the games progress, hunters stand out more, being capable of dealing tons of damage late game. The damage and well-being of your hunter, depends heavily on your items. A hunter with items that don't fit him/her is simply deadweight. Skadi's kit is different than that of most other hunters, in the way that she has a "companion". Her companion can assist her in fights, much like Artemis' boar, however, this companion is permanent [It stays with you all the time] and does not stun, but simply attack as the player commands too. Other than that, Skadi's kit is mostly similar to that of other hunters, having a weak but helpfull ultimate, a lane clearing skill, and another skill that can be used in various situations. Leaving the "general" aspect of this guide, let's get into the items. - Move faster: As a hunter, you're squishy. Your health can drop from full to 0 in a second. To be able to escape danger, you need to be able to move as fast and swiftly as possible. - Attack faster: A hunter relies heavily on basic attacks. The faster you hit, the more damage you'll push out. Needed to get the kills early game, and still usefull late game, as this item will allow you to kill most enemy's before they kill you. - Do more damage: Physical Power. This is what a hunter needs, as if they're addicted too it. More physical power = more damage, allowing you to kill enemies easily. Jotunn's Wrath is by far one of the most usefull items in this build. It has alot of usefull benefits for any hunter. - Physical power: Let's you push out more damage. - Gives more Mana: While hunters rely mostly on basic attacks, hunters can get many benefits out of their skills, especially Skadi. We'll get into the "why" later. - Physical penetration: If an enemy builds physical protection, this will help you break through that defense a bit, so your damage from your basic attacks isn't rendered useless, because as a hunter, you need that damage. - Cooldown reduction: Skadi needs this for her Ultimate. Again, "why" comes later. The Soul Eater item allows you to "absorb" health from those you damage, allowing you to stay in the fight a little longer and thus pushing out more basic attacks. - Physical lifesteal: Allows you to take health from enemy's, that can keep you alive longer. Much needed for hunters, especially when laning. - Attack speed: More attack speed! This means more attacks in a given time and thus more damage! - Passive that allows you to heal a maximum of 20% of your health in an instant when you drop below 50% health. Passive: Per kill, gain 1 stack (max 20 stacks). When your health goes below 50%, all stacks are consumed and heal 1% of your health/stack. The Frostbound Hammer is a very usefull item for a hunter, as it gives you health and power. Because of the health you can live longer and thus attack longer, and get extra power aswell. The passive on this item is good to catch a runner and finish them off. - Physical power: Let's you deal more damage. - Health: So you can take more hits before dying. - Passive: Slows enemies and their attacks when you hit them with a basic attack. Passive: Enemies hit by your basic attack are 30% slower and attack 15% slower, for 1.25 seconds. The Deathbringer item focuses around critical hits. With a increase to your chances of getting a critical hit, making your critical hits stronger and giving you more power, this is a much needed item for any hunter. - Critical strike chance: More chance to get critical hits. Critical hits do ~2x the damage of a regular hit. Getting critical hits can finish enemies off real quick. - Passive: Your critical hits do 40% more damage. Passive: Your critical hits do 40% more damage. Last but not least, the Malice item is very usefull and stacks perfectly with the Deathbringer item. It gives more power, even more critical hit chance, and has a nice passive on it aswell. - Critical strike chance: You have a higher chance at getting critical hits, which deal ~2x more damage than a regular hit. - Passive: After you get a critical hit, over the next 3 seconds you deal +75% of your physical power on every hit. Another critical will refresh this effect. Passive: On critical hit - every attack within 3 seconds deal +75% of your physical power. Effect refreshes each critical hit. - Lots of physical power. - Increased health and mana. Warrior Tabi is a great item for any character. It does nearly the same as the Ninja Tabi, however it provides no attack speed and more power. If you are prepared to lose some attack speed in return for some damage, this is a perfect starting item for you! -This item increases your physical power, allowing you to do more damage. With more damage, you'll have a bit of an easier start against enemy gods. However, since it loses attack speed bonus, you'll probably take a bit longer to clear minion waves at first. -This item grants movement speed. A must have for every god. Without movement speed, you'll be an easy kill for everybody if you can't run away fast enough. Qin's Sais is perhaps one of the most common item's for a power build, mainly because of it's passive. This item is amazing to dispatch nearly all enemy gods, including tanks. -This item grants physical power. -This item gives you an attack speed bonus. This makes up for the loss of attack speed from Ninja Tabi. -The passive let's you deal 4% of your target's MAX. health per basic attack. Watch the tank's health drop! PASSIVE - Deal 4% of your target MAX. health per basic attack. Asi Is a very common item in power builds. It gives a bit of life steal and attack speed. While it's life steal isn't as high as, say blood forge's, it allows for some sustain while making you able to put out more damage. However, it's passive allows for it's lifesteal to nearly match that of blood forge's. -This item grants attack speed. -This item grants lifesteal. Lifesteal let's you absorb a bit of health per hit. This allows for a form of sustain during a fight. -This item grants Physical penetration. This increases damage against objectives (eg. towers), and allows you to break through some enemy god's protections. -It's passive makes it so that when you're below 35% health, you gain +25% Lifesteal for 5s (only occurs MAX. every 15s). The Executioner is a very good item to eliminate threats quickly, especially in combination with above items. It gives physical power and attack speed, but on top of that lowers your target's physical protection per hit. -This item has a passive that lowers your target's physical protection by 8% per basic attack hit, for 3s. MAX. 4 stacks. PASSIVE - Basic attacks -> Reduce target's physical protection. 8% for 3s, 4 stacks. There isn't much too say about Titan's Bane. It gives you Physical power and Physical penetration. This allows you to do more damage against gods and towers, and makes it so you bypass some of your enemy's protections. -This item gives you Physical power. -This item gives you a Physical penetration bonus through it's passive. PASSIVE - 33% Physical penetration. Deathbringer has been mentioned in Build #1. Please refer to that list, above. This item has been mentioned in Build #1. Please refer to that list, above. Rage is defenitely a good item if you're going for a Critical hit build. It ties in very well with Deathbringer, but you'll have to sacrifice another item in return. My recommendation is to replace The Executioner. -This item increases critical hit chance. -Passive makes it so that if you do not have a critical hit, your chance to hit critical is increased by 10%, max 6 stacks. Resets upon critical hit. PASSIVE - If basic attack is not crit. -> Increase crit. chance +10%, MAX. 6 stacks, resets upon critical hit. Last but not least, Transcendence if your goto item if you're running out of mana alot. It also grants physical power. You'll have to sacrifice another item tough. My recommendation is The Executioner. -This item's passive Converts 3% of mana into physical power. You gain 5 stacks for a god kill and 1 stack for a minion kill, MAX. 50 stacks. Per stack you gain 15 mana. PASSIVE - Stacks. +5 stacks/god kill, +1/minion kill - MAX. 50 stacks. +15 mana / stack. 3% of mana converted too Physical power. A replacement for Deathbringer. If you're good with controlling Kaldr, you won't need Deathbringer. Deathbringer is an item for players who are not able too control Kaldr too it's full potential, e.g. new Skadi players. As you learn how too control Kaldr well enough, you'll be able too swap this out for Hastened Fatalis. The reason for this is because Kaldr will now do the damage for you, and you can use Hastened Fatalis for escaping/surviving purposes, such as dodging attacks. - The item gives you 30% attack speed. Because of this you will attack faster and dish out more damage. - You'll gain 10% extra movement speed. This combined with Permafrost grants you alot of movement speed and thus more chances too escape. - The passive removes the movement penalty from you when you land a basic attack. PASSIVE: No movement penalty on basic attack hit. Skadi relies mostly on her basic attacks. However, her skills can help her in landing het hits and other situations. The only problem is that these skills are rendered useless if you don't know how to use them correctly, or if you don't use them to their full potential. Skadi's companion, Kaldr, will fight any enemy the player commands him too. Kaldr however, does nothing by itself. Your companion is controlled by your "2". A "laning attack is, for example, a minion. Kaldr can't attack or be attacked. He is in this form when he walks by your side, when you recall him, or when he loses all his HP. In this form, he will stand by the player and regenerate HP. Kaldr, while technically unkillable, can lose all of his health, in which he automatically switches to elemental form and return to the player to heal. Kaldr can die pretty fast, so be wary of the situation when activating him. HP regen: 1 HP / 10 seconds. Can be used as a skill to damage/kill gods. However, it's most effectively used to clear waves of minions. This skill can be used at any time. With this, you can target an enemy and command your wolf to attack. Pressing the button again will 'recall' your wolf. It's best to combine this with the ultimate of Skadi. This skill can be used at anytime: clearing waves or damaging gods. When using it to damage minions, make sure the whole wave is in the circle for maximum effectiveness. When using it to damage gods, you need to place it with caution. Try placing it in such a way that the enemy god stays on the circle the longest, and preferably gets stuck inside the circle. When you're low on health, avoid using it on gods running towards you, since this will make them slide to you even faster and you'll end up messing yourself up. - Keeping 'stalkers' at bay. You can use it for those 3 things, but it's not recommended, unless it's really needed or you're confident enough you'll get good use out of it. The most recommended way is to use this skill right after you sent your wolf. - Kaldr becomes immune to all attacks for the duration of this skill, so the wolf can attack without dying and having to return. - Enemies within the radius of your ultimate are rooted, so they can't move. This makes it so that your wolf can easily attack enemies, without having to chase them and can focus primarily on attacking. Also, while the enemy is rooted, you can attack the target aswell, while being assisted by your wolf. The relics you should choose can be found atop this guide. -Sprint: This allows you to run faster, and escape death or even chase enemies who are trying to run away. Since Skadi has no escape move, you're heavily reliant on how easily you can get away from the damage source that's hitting you. -Meditation: This item gives mana, so use this if you're low on mana, use this so you can use your skills a last time. Or if you're about to die you can also use this for a bit of health so you can try to escape your enemy. Not recommended, but still usefull. Heavily situation dependant. -Purification: It can be very usefull, for example when you're slowed and need to escape, pop this. However, most of the time you're dead by the time you used this, or the enemy will still kill you after you've cleansed yourself. Sprin't also removes slows and makes you faster, so it's recommended to take that instead. This item removes CC effects! - Do you run out of mana often? Get meditation! - Does the enemy use lots of slows or other crowd control effects? Use sprint and purification. - Are you getting battered all the time? Trying combining sanctuary and sprint to form a nice escaping combo. That's it for my guide. It's a lot of text and my arm is nearly falling off. I hope this guide is understandable for everyone. I'm not the best at using BB and colors, especially not for such a long text. Have fun in SMITE! - While Kaldr's attacks give Skadi some movement speed, it's fairly inconsistent. If the enemy keeps running, Kaldr may have a hard time keeping up and thus be unable to land hits, resulting in no movement speed gain. Hastened Fatalis always gives movement speed, regardless the scenario, which will allow you to keep up with an enemy more easily if Kaldr is unable to. - When Kaldr is out of life points, you cannot use his attacks for movement speed. Since you'll only send Kaldr out in 1v1s, to finish off low health enemies and when he has 4/5 life points, you'll find Kaldr in spiritual form more often than not, causing the movement speed to not proc as often. - While this guide was made in S3, the build is still functional in S4, and with Skadi's ultimate nerf in 4.6, Hastened Fatalis' movement speed has become even more useful since Kaldr is no longer immune during Winter's Grasp, which will make Kaldr's attacks and thus the movement speed bonus even more inconsistent. - When running away from an enemy, you have to turn around before you can set Kaldr to attack those who're chasing you. Turning around will slow you down, and can get you killed before Kaldr is even capable of giving you that movement speed buff. - Hastened Fatalis' movement speed, passive + Permafrost and Kaldr's speed bonus on attack all combined will make it easy for you to stick to target. In fact unless your target has a leap / dash or you get CC'd, there's almost no escape for your target. That is, if you can land your attacks and make use of Hastened Fatalis' passive, but if you can't land basics then Odysseus' Bow won't help you either. Odysseus' Bow is definitely a viable replacement if you're not familiar with Hastened Fatalis or build for attack speed reliant build sets, but other than that I feel that Hastened Fatalis still takes the upper hand of the 2. That is just my personal opinion though. Hopefully you understand what I'm going for here. 117915 xZeroStrike Hey XistTheWizard. I can understand where you're coming from. However, I've selected [[Hastened Fatalis]] over [[Odysseus' bow]] in the main build for a couple of reasons: - While Kaldr's attacks give [[Skadi]] some movement speed, it's fairly inconsistent. If the enemy keeps running, Kaldr may have a hard time keeping up and thus be unable to land hits, resulting in no movement speed gain. [[Hastened Fatalis]] always gives movement speed, regardless the scenario, which will allow you to keep up with an enemy more easily if Kaldr is unable to. - When Kaldr is out of life points, you cannot use his attacks for movement speed. Since you'll only send Kaldr out in 1v1s, to finish off low health enemies and when he has 4/5 life points, you'll find Kaldr in spiritual form more often than not, causing the movement speed to not proc as often. - While this guide was made in S3, the build is still functional in S4, and with [[Skadi]]'s ultimate nerf in 4.6, [[Hastened Fatalis]]' movement speed has become even more useful since Kaldr is no longer immune during [[Winter's Grasp]], which will make Kaldr's attacks and thus the movement speed bonus even more inconsistent. - When running away from an enemy, you have to turn around before you can set Kaldr to attack those who're chasing you. Turning around will slow you down, and can get you killed before Kaldr is even capable of giving you that movement speed buff. - [[Hastened Fatalis]]' movement speed, passive + [[Permafrost]] and Kaldr's speed bonus on attack all combined will make it easy for you to stick to target. In fact unless your target has a leap / dash or you get CC'd, there's almost no escape for your target. That is, if you can land your attacks and make use of [[Hastened Fatalis]]' passive, but if you can't land basics then [[Odysseus' bow]] won't help you either. [[Odysseus' bow]] is definitely a viable replacement if you're not familiar with [[Hastened Fatalis]] or build for attack speed reliant build sets, but other than that I feel that [[Hastened Fatalis]] still takes the upper hand of the 2. That is just my personal opinion though. Hopefully you understand what I'm going for here. Have fun playing SMITE! 116252 sunny108108 Mice build for skid! 117356 Bernardozomer Mouse builds for skids! Hi, Zero. I would personally like to say that Skadi's my favorite goddess. Due to recent changes, I think it would be better to go Ninja Tabi instead of Warrior Tabi, because it now gives mana, which would work great with Transcendence, and that it gives attack speed for Kaldr to work, as late game, Skadi and Kaldr will both have the same attack speed. 111891 IceColdPappsi Hi, Zero. I would personally like to say that Skadi's my favorite goddess. Due to recent changes, I think it would be better to go [[Ninja Tabi]] instead of [[Warrior Tabi]], because it now gives mana, which would work great with [[Transcendence]], and that it gives attack speed for Kaldr to work, as late game, [[Skadi]] and Kaldr will both have the same attack speed. With Ninja Tabi, you'll deal less damage than with Warrior Tabi. You'll lose 17 physical power to be exact, in this build. The attack speed should make up for it. However, when relying on attack speed, you're counting on a longer, more consistent battle. You see, before Ninja Tabi's power output reaches equal potential of that of Warrior Tabi's, it needs some time to get there. Due to Kaldr's low health pool, he can die very fast. This will result in only a very short combat sequence, thus Ninja Tabi's potential will be lost, and its benefits won't be as good as that of Warrior Tabi's. When sending Kaldr out, you want to get damage in fast, and get him out even faster, as to not get him "killed". Therefore, the lower attack speed, but a lot higher Physical Power will be better, since Kaldr simply won't have enough time to let the lower damage and higher attack speed make up for the power loss. I don't think purchasing boots along with the Morningstar is a very viable option. Potions are always better for that sustain. The boots are specifically for a bit of movement speed. Potions will work but if you can't escape your enemy those potions will be rendered useless faster than one can say he used it. I made a small table on when I think it's better to select which starting gear, and I've also included the potions start as an option. I guess it comes down to preference and situation. If you play safe and conservative enough, the potions shouldn't be necessary. Nice build :) I just prefer to buy Qin last item to get that extra damage+attack speed ! 110761 OpkNC Nice build :) I just prefer to buy Qin last item to get that extra damage+attack speed ! I didn't include it because Skadi has Kaldr allready, which makes up for it, but still a very good item nonetheless, specifically when dealing with tanks. 110766 xZeroStrike A good option. I didn't include it because [[Skadi]] has Kaldr allready, which makes up for it, but still a very good item nonetheless, specifically when dealing with tanks. Under "hunters without leaps" you left out Ah Muzen Cab. Other than that, I don't see anything wrong. 110698 Technotoad64 Under "hunters without leaps" you left out [[Ah Muzen Cab]]. Other than that, I don't see anything wrong. [color=#00ff00]+1[/color] for n[color=#aaddff]ice[/color] tables. Thank you, I'll add Ah Muzen Cab immediately! And thank you for the +1! 110701 xZeroStrike Thank you, I'll add [[Ah Muzen Cab]] immediately! And thank you for the [color=#00ff00]+1[/color]! I... I am absolutely impressed by your guide's appearance; it just looks so cool. The way all of the tables are scripted- simply masterful. Overall coloring also matches Skadi's theme really well; but I have to agree with nikvundle that at least in the Strategies section, there's a bit too much of the white color in the sentences- maybe it's because of the bright arts and headings in the background, but I found it a bit distracting- maybe switching to some mild blue-ish color would be an option? Onto the build; it's really well explained and looks very solid- my only question would be about the Hastened Fatalis- not that I have anything against it as it makes perfect sense; but would like to ask if you could possibly recommend a viable replacement option for it (maybe an Odysseus's Bow for the attack speed, and its passive would hit for quite a bit with all the power the build provides? ), as buying fatalis tends to significantly change playing experience, and I personally am having trouble hitting my auto-attacks with this item, aspecially when boxing other hunters. I also have some thoughts about the starting build- when buying Charged Morningstar to progress it into Transcendence, I would recommend to consider buying some HP and mana potions with the 300 gold left instead of the Boots, as without them you'll probably be forced out of lane way too early (not to mention that it'd be quite easy to gank a poked Skadi ) and actually lose some gold in the process. Of course potions can be skipped in Arena and whatnot, but I think in Conquest they're much safer option. That partially leads to the recommended "first return"- if someone asked me, I think that it would be more beneficial to back whenever you have enough gold to just finish your Transcendence. Firstly because you'll be able to start stacking faster that way, and secondly because staying such a long time in lane would likely result in being forced under tower, losing potential income and thus prolonging the time required to stay even more. With that being said, I am not a Skadi player myself and I'm sure someone (ehkem DucksRock, I summon thee) would provide more helpful feedback, but those were my thoughts. I liked the ability combos section with all the explanations the most- very helpful for anyone attempting to play this character. I guess I shouldn't have to mention that's an easy upvote? Keep up the good work! Looks even better than before with that color if someone asked me. 110694 Daelinn I... I am absolutely impressed by your guide's appearance; it just looks [color=#87CEFA][b]so cool[/b][/color]. The way all of the tables are scripted- simply masterful. Overall coloring also matches [[Skadi]]'s theme really well; but I have to agree with [color=#FFFF00]nikvundle[/color] that at least in the Strategies section, there's a bit too much of the white color in the sentences- maybe it's because of the bright arts and headings in the background, but I found it a bit distracting- maybe switching to some mild blue-ish color would be an option? Onto the build; it's really well explained and looks very solid- my only question would be about the [[Hastened Fatalis]]- not that I have anything against it as it makes perfect sense; but would like to ask if you could possibly recommend a viable replacement option for it (maybe an [[Odysseus's Bow]] for the attack speed, and its passive would hit for quite a bit with all the power the build provides? ), as buying fatalis tends to significantly change playing experience, and I personally am having trouble hitting my auto-attacks with this item, aspecially when boxing other hunters. I also have some thoughts about the starting build- when buying [[Charged Morningstar]] to progress it into [[Transcendence]], I would recommend to consider buying some HP and mana potions with the 300 gold left instead of the [[Boots]], as without them you'll probably be forced out of lane way too early (not to mention that it'd be quite easy to gank a poked [[Skadi]] ) and actually lose some gold in the process. Of course potions can be skipped in Arena and whatnot, but I think in Conquest they're much safer option. That partially leads to the recommended "first return"- if someone asked me, I think that it would be more beneficial to back whenever you have enough gold to just finish your [[Transcendence]]. Firstly because you'll be able to start stacking faster that way, and secondly because staying such a long time in lane would likely result in being forced under tower, losing potential income and thus prolonging the time required to stay even more. With that being said, I am not a [[Skadi]] player myself and I'm sure someone (ehkem [color=#FFFF00]DucksRock[/color], I summon thee) would provide more helpful feedback, but those were my thoughts. I liked the ability combos section with all the explanations the most- very helpful for anyone attempting to play this character. I guess I shouldn't have to mention that's an easy upvote? Keep up the good work! EDIT: Looks even better than before with that color if someone asked me. Thank you for your feedback. I'll see if I can change the white to something darker that is not grey. - Are you facing an enemy that can easily catch up? (e.g. Neith with her backflip). Then I'd say you'll need the boots to escape, unless you plan on staying near your tower for the entire duration, but then you're risking to lose famr. - Are you facing an enemy that can't easily catch up to you? (e.g. Artemis, who has no dash/leap or any of the sort) Then potions would probably be a better option, assuming you've used Wards to alert you from ganks, which you, or preferably your support, should do by default. As for the "first return option", you have to follow its order. Meaning that even though you would have enough money to buy Combat Boots or Warrior Tabi, you should allways finish Transcendence first. And it is advised to stay in lane until you have just enough money to upgrade to Transcendence unless you're forced to back. Last but not least I guess Odysseus' Bow could work if you're not used to Hastened Fatalis. I'll add this onto the build as a "potential replacement"
Edit: All your feedback had been applied. If the color is yet again not good enough, feel free to let me know. 110695 xZeroStrike Thank you for your feedback. I'll see if I can change the white to something darker that is not grey. [rule] As for the potions start: It is entirely possible to do so. You do have to remember that until you get [[permafrost]], you'll be very slow which could also put you at risk. I guess it all comes down to the situation itself: - Are you facing an enemy that can easily catch up? (e.g. [[Neith]] with her backflip). Then I'd say you'll need the boots to escape, unless you plan on staying near your tower for the entire duration, but then you're risking to lose famr. - Are you facing an enemy that can't easily catch up to you? (e.g. [[Artemis]], who has no dash/leap or any of the sort) Then potions would probably be a better option, assuming you've used [[ward]]s to alert you from ganks, which you, or preferably your support, should do by default. [rule] As for the "first return option", you have to follow its order. Meaning that even though you would have enough money to buy [[combat boots]] or [[warrior tabi]], you should allways finish [[Transcendence]] first. And it is advised to stay in lane until you have just enough money to upgrade to [[Transcendence]] unless you're forced to back. [rule] Last but not least I guess [[Odysseus' Bow]] could work if you're not used to [[Hastened Fatalis]]. I'll add this onto the build as a "potential replacement" Thank you for your feedback, and the upvote! :) Edit: All your feedback had been applied. If the color is yet again not good enough, feel free to let me know. The guide is really cool and well done, you got UPvote from me, the only thing that i found Kinda annoying is Too Many Colors it's really nice to add colors, but i it be annoying if there was too many especially in the same line, it Distracts the Reader and It makes the Mind Reading Process Harder, OtherWise, Well done !! 110672 nikvundle The guide is really cool and well done, you got UPvote from me, the only thing that i found Kinda annoying is [b][color=#ffffff]Too Many Colors[/color][/b] it's really nice to add colors, but i it be annoying if there was too many especially in the same line, it Distracts the Reader and It makes the Mind Reading Process Harder, OtherWise, Well done !! Thank you for your feedback. I'll see if I can reduce the amount of colors. 110686 xZeroStrike Thank you for your feedback. I'll see if I can reduce the amount of colors. Good guide, the only issue I have is that you included Frostbound Hammer. You already have an extremely potent slow in your kit and frostbound hammer provides diminishing returns on the slow effect. In fact, once they are slowed by Piercing Cold, Frostbound Hammer barely adds onto the slow at all. If you need frostbound hammer in a Skadi build, you either can't land her 1 or you aren't using Kaldr and the rest of your kit to properly to maximize off of your 1. 107137 LinkNightblade Good guide, the only issue I have is that you included Frostbound Hammer. You already have an extremely potent slow in your kit and frostbound hammer provides diminishing returns on the slow effect. In fact, once they are slowed by [[Piercing Cold]], Frostbound Hammer barely adds onto the slow at all. If you need frostbound hammer in a Skadi build, you either can't land her 1 or you aren't using Kaldr and the rest of your kit to properly to maximize off of your 1. Thank you for your feedback. I see where you're coming from. The reason I placed the Frostbound hammer in is mainly because of it's physical power, but the slow just adds nicely for chases, or when your 1 is on CD. Also if the enemy beads out of your skills the slow can help really well. 107582 xZeroStrike Thank you for your feedback. I see where you're coming from. The reason I placed the Frostbound hammer in is mainly because of it's physical power, but the slow just adds nicely for chases, or when your 1 is on CD. Also if the enemy beads out of your skills the slow can help really well. The hammer doesn't provide much power, 30 if I recall correctly. There are far better options for power. 117352 LinkNightblade The hammer doesn't provide much power, 30 if I recall correctly. There are far better options for power. Frostbound Hammer's power is equal to Titan's Bane and The Executioner, so I think it to be fairly decent regarding that. But that's beside the point, as Frostbound Hammer is no longer part of any of the suggested items. Also this guide may be somewhat outdated. 117354 xZeroStrike Welcome back! Almost a year late to the party, but whatever. x) [[Frostbound Hammer]]'s power is equal to [[Titan's bane]] and [[the executioner]], so I think it to be fairly decent regarding that. But that's beside the point, as [[Frostbound hammer]] is no longer part of any of the suggested items. Also this guide may be somewhat outdated. This guide is listed as a S4 guide but the title says that it is a S3 one. Which one is right? 117355 Bernardozomer This guide is listed as a S4 guide but the title says that it is a S3 one. Which one is right? The title. It most likely flagged it as an S4 guide because I added the "notification" that you can find in the introduction after S4 was released. However, the title is still correct and the guide still represents S3. While the build will most likely still work and most of the information is still correct, some information may be outdated or missing. 117357 xZeroStrike The title. It most likely flagged it as an S4 guide because I added the "notification" that you can find in the introduction after S4 was released. However, the title is still correct and the guide still represents S3. While the build will most likely still work and most of the information is still correct, some information may be outdated or missing.